Sedona and its surrounding area are so scenic, that it’s easy to enjoy a beautiful day trip in almost any direction that you drive! The highlight of this day tour definitely is the trip up Oak Creek Canyon, called a drive never to be forgotten in a 1937 tourist guide and it still is very much the same thing today. Every rock-bordered curve, every tree-formed tunnel, every climbing turn of this road features more natural beauty than the one before, and the romance that shrouds this area fairly hangs from the giant, creek-side cottonwoods and sycamores. This canyon abounds with historic landmarks, too like Midgely Bridge, which crosses Wilson Canyon; Indian Gardens, where early settlers farmed; the site of burned-down Mayhew Lodge, which attracted presidents and movie stars; and an old lodge where Zane Grey wrote Call of the Canyon. As you approach Flagstaff, note Northern Arizona University on your right as you continue into this city’s historic downtown area, where main street used to be beloved Route 66. Stop at the chamber of commerce office in an old depot for complete information about Flagstaff. However, know that Lowell Observatory, where Pluto was discovered, is west of downtown, and Arizona Snowbowl, an excellent ski area on the 12,000-foot San Francisco Peaks is about 7 miles north. On your way back to Sedona, stay on I-17 as you drive south through the Coconino National Forest; take the State Route 179 exit and travel north through Village of Oakcreek before oohing and aahing your way into this city from the south. Take State Route 179 through Village of Oak Creek to I-17 and head south toward Camp Verde. Exit the freeway on Middle Verde Road, travel east and watch for signs to Montezuma Castle National Monument and Montezuma Well, where it is fun to locate ancient ruins while walking through an unexpected, inviting riparian area. Continue to Camp Verde and Fort Verde Historical Park, site of old Fort Verde, and then take Hwy 260 three miles west of I-17 to visit Out of Africa Wildlife Park for an African Bush Safari tour. Head back to Hwy 260, and take a left to Cottonwood. Drive through Old Town and continue on the original road to Clarkdale for a couple of miles before turning north on Tuzigoot Road, which leads to Tuzigoot National Monument, a prehistoric Indian ruin. Continue on the old road to Clarkdale and follow signs to the Verde Canyon Railroad depot. Here, you might want to take a trip on this historic train before continuing through Clarkdale, an interesting little community that was established as a company town when the railway serviced a large smelting operation. Drive north to State Route 89A and climb the twisting road up Cleopatra Hill, where you will be amazed by the spectacular setting of Jerome, an early mining, then ghost, eventually hippie and now, arts and crafts community. Here, discover Jerome State Historical Park and Jerome Historical Society Mine Museum, perhaps. 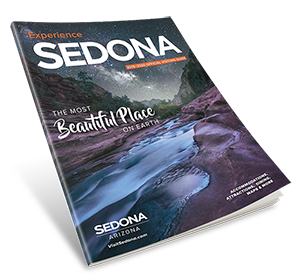 Return to Sedona through Cottonwood on State Route 89A, noting beautiful views of the San Francisco Peaks at Flagstaff and the massive red-rock formations at Sedona as you descend Cleopatra Hill. As you near Sedona, watch for FR 525, a dirt road in the Coconino National Forest. If you have time, follow this route to Palatki and Honanki, very large and impressive ancient ruins, before coming into this community on Dry Creek Road. You’ll need to make reservation in advance for Palatki Cultural Site – call 928-282-4119. Red Rock Pass required for both Honanki and Palatki. Travel to Flagstaff on State Route 89A through spectacular Oak Creek Canyon, continue north through town to Hwy 180, which heads northwest through the Kaibab National Forest. This inviting route circles the base of the majestic San Francisco Peaks, which are snow-covered during late fall, winter and early spring and especially in the fall, when millions of aspens gloriously turn gold, traveling through this area is a mesmerizing experience. While enjoying the scenery, also be aware that you are passing through the southwestern portion of the vast, geologically significant Colorado Plateau, which is bordered by Phoenix, Las Vegas, Salt Lake City, Denver and Albuquerque. After intersecting with Hwy 64, continue north to the South Rim of the Grand Canyon and if this is your first time to the canyon, prepare for one of the most awesome sights of your life. Follow Hwy 64 east along the rim, passing the historic lookout tower at Desert View before connecting with Hwy 89 at Cameron. Turn south and enjoy another startling view of the San Francisco Peaks as you travel through the area where national monuments named Wupatki, Sunset Crater Volcano and Walnut Canyon are located. After passing through downtown Flagstaff and heading south on I-17, exit onto State Route 89A and slowly, but surely, descend through Oak Creek Canyon into Sedona.